Next to ASO and RCS Sport, Flanders Classics is considered the third largest race organisation, at least where importance is concerned. Among the races it organises are Omloop het Nieuwsblad, the Scheldeprijs and the WorldTour races Gent-Wevelgem and the Tour of Flanders. In September last year, the organiser published the new route of the Tour Of Flanders for the next two years. Other than the start, which remains in Brugge for at least six more editions, the route has been redesigned completely. Absent is the mythical Muur Van Geraadsbergen, pivotal point in the race since the 70s and consequently the race does not finish in Meerbeke. Instead, the finale consists of three large loops around the Oude Kwaremont and Paterberg before the new finish in Oudenaarde. The director of Flanders Classics, Wouter Vandenhaute, told on a press conference on Thursday that it was time now for him to step forward and explain why he thought the Monument needed a change. When the new route of this year's edition was announced, the organiser of the monumental one day race knew the changes that were decided on would evoke emotional reactions and he even expected personal criticism. He and his company wisely decided he would stay out of public debate for a while. "But the reactions were even more emotional than we expected," he told the gathered press. Emotional they were indeed. 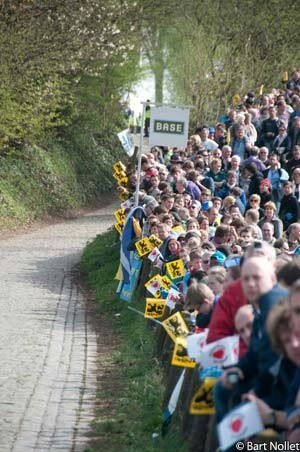 The exclusion of the Muur especially upset thousands of fans, who gathered, debated and made sure their voices were heard. In the city of Geraadsbergen, a few hundred participants joined a funeral procession that was organised, for the new route meant the death of de Ronde as they saw it. On the internet, discussions aplenty as well; some creative people went as far as parodying Hitler in a scene from the movie 'Der Untergang', suggesting the Ronde sold their soul to commercialism and that it meant the end of a race that's so close to their hearts. "The Ronde Van Vlaanderen [as the race is named in Dutch - ed] is part of Flanders' cultural heritage," Vandenhaute explained. "I went out to get a feel for the new finale together with Eddy Merckx and [journalist] Marc Uytterhoeven. They were skeptical at first, but they changed their minds gradually and want to give [the new route] a chance. Riders are enthusiastic too'. A few days after the route was announced, riders such as Tom Boonen, Fabian Cancellara and Phillipe Gilbert indeed openly gave their support to the new route and with that, the sometimes harsh criticism lowered to a reasonable level. According to Vandenhaute, the Ronde ought to be centered around the Flemish Ardennes, the hilly area east of Oudenaarde. "People's experience is much higher there, in regards to the finale as it was until last year. There's few spectators on the roadside along the long and straight stretches between the hilly zone and the Muur, and between the Muur and Meerbeke. The experience on the Muur is absolutely fantastic, but its location in the course is not convenient," he concluded. The changes to the course push cycling into a new direction, as Vandenhaute explained: "If the new route is succesful, the Ronde could set an example for all one day classics. To race from A to B doesn't have much longevity no more," he thinks. "With the new concept, spectators have the chance to see the riders three times, right there in the finale of the race. They can settle themselves in the morning for a day of festivities. We're going to put up large TV screens, there's be portable toilets installed and other infrastructure." Asked wether the organiser was planning to ask entree fee, Vandenhaut was quick to avoid the question. "What I find important is that cycling remains close to the people and for the coming years the race will be free," he replied. "I do not rule out it always staying a free event though, but it will never be an exclusive event to VIP's only." He was quick to add that the 61000 spectators at the recent Cross World Championship in Koksijde all paid 25 euro (28 US$) entree free without anyone complaining. With the world of cycling in motion, the Tour of Flanders could lead the path to a new business model, in which the money earned and spent will be different from the way it is now. The wide open sections of the route until 2011, sometimes allowed those that were not necessarily the strongest riders to win, as riders who'd fallen back had the chance to rejoin the front group. With the finale being tougher come 2012, it is expected that the winner of the Tour of Flanders will actually be the strongest rider on that day; hence it's no surprise Boonen, Cancellara and Gilbert gave their thumbs up.